Ironically, the relatively modern LUJ/LUV uses the relatively old-school “EV1” style fuel injector connector. As such, aftermarket fuel injector choices are somewhat limited unless costly harness adapters are used. These fuel injectors have been popular in the aftermarket for some time. This a very good, general purpose fuel injector for the 1.4T engine, because they're not so large that they cause injector misfire or over fueling problems at idle. They are available with an “EV1” style connector, so harness adapters are not necessary. They are large enough to support full E85 on the stock turbo, and mild turbo upgrades (e.g. compressor wheel upgraded units). However, there are three problems with them: Fakes / non authentic replicas: When we first started testing these injectors back in the 2011-2012 time frame, the first set we received worked fantastic. Then, our supplier sent us a new set which were “much cheaper”. Despite looking the same, these did not work well, at all. The engine had misfire problems at idle. Upon investigation, we determined that this second “cheaper” set of fuel injectors was in fact a replica and was built using very poor manufacturing tolerances. Price: Why are there replicas / knock offs? The answer is simple: the authentic units are expensive! As of this writing, authentic “green giants” cost anywhere from $200-$250, retail, for a set of 4. Availability: For reasons not yet determined, the availability of the “green giants” has diminished as of late. Most retailers have them back ordered. As of more recently, the Bosch 52# fuel injector has become an option for the 1.4T. They share most of the same benefits that the “green giant” does, however, there are two problems with these fuel injectors: Not “EV1” connector: This one's simple. They won't directly plug in to the engine harness of the 1.4T. As such, to use these, you need to add bulky, costly harness adapters. 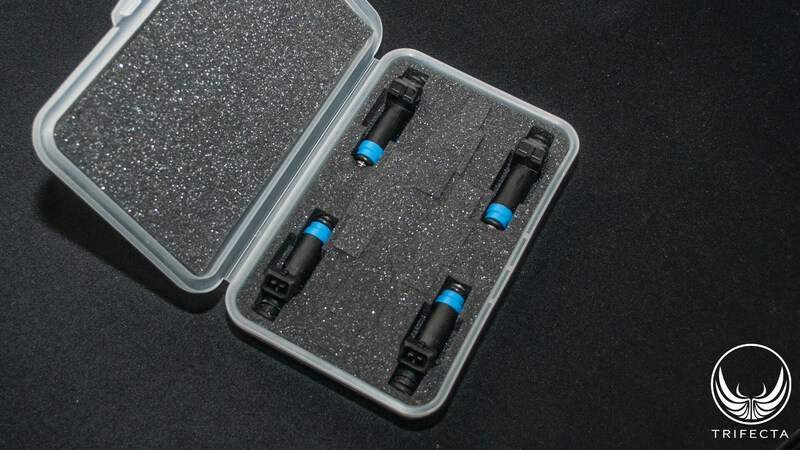 Price: Looking around at various retailers, a set of these injectors, with the required harness adapters will run you anywhere from $250 - $300 for a set of four. You can throw a stone and hit five gear heads that know what these injectors are. They were one of the first widely-available “EV1” style aftermarket fuel injector upgrades for the LS1 engine dating back to the end of the last century. These fuel injectors are high performance with enough fuel flow to solve the fueling problems of almost any streetable high performance build. They are readily available, being very easy to source. They are also one of the lowest cost high performance aftermarket fuel injector available, with a set of four pricing in at $150-$200. Because they are available in the “EV1” style connector, they can be used on the 1.4T without harness adapters. If they could be used on the 1.4T, they'd be the perfect choice. However, they are also notoriously finicky in some regards, and based on our early research, were ruled out as feasible. That's changed now, though. First, a discussion about the problems with them. One of the issues that's plagued tuners since the SD-60s became available is their short pulse width operation. The larger (higher flowing) a fuel injector is, the more fuel it moves for a given amount of “open” time (pulse width). Also, the larger a fuel injector is, the more difficult it is to control at extremely short pulse widths, because the internal parts are larger, and therefore, heavier. If a fuel injector is operated at too short a pulse width, the injector can “misfire”. The ECU tries to open and close the injector so fast, it cannot do so reliably. When it fails to open and close, no fuel is injected, and the cylinder misfires. These two issues confluence to make idle operation with SD-60s extremely problematic and challenging. On larger engines, like the LS1, for instance, which displaces .7125L / cylinder, the SD-60s are relatively close to providing the correct amount of fuel for idle operation. However, on smaller engines, like the 2.0L SC MPFI (LSJ) – which displaces .5L / cylinder – the SD-60s cannot run at a short enough pulse width for proper fueling. So a tuner is left with making a choice between two not-so-good scenarios. Either they can live with the injector misfiring at idle, or they live with pinning down the minimum injector pulse width to avoid misfiring, but which causes the idle mixture to be too rich. The 1.4T is EVEN SMALLER, clocking in at .35L / cylinder. In other words its fuel demand per cylinder is roughly HALF of the LS1 engine. This means the problems seen on the 2.0L are even worse. Did you know that your Gen 1 Cruze / Gamma II has a variable speed fuel pump? It's true. And it's controlled by a discrete ECU called the Chassis Control Module (CCM). The CCM receives messages from the Engine Control Module (ECM) that dictate what the fuel pressure supplied to the injector rail should be. Why? The answer is that because these vehicles are both MPFI and turbocharged, the fuel pressure supplied to the injector rail needs to be varied based on how much boost there is in the intake manifold. The factory calibration varies the pressure between 300kPa (43.5 psi) and 400kPa (58psi) depending on the operating conditions. In our earlier research, we experimented with SD-60s and a lowered commanded fuel pressure in the ECM calibration. However, at the time, the CCM would not honor requests from the ECM to run the pump at a pressure level that was low enough to work with the SD-60s. More recently, however, we decided to look into whether we could change the CCM's calibration to honor requests from the ECM to run the fuel pressure at a level that was low enough to support the SD-60s. Here's the deal: Yes, the SD-60s flow way too much fuel (at idle) for the 1.4T – but that's at 43.5psi. If you lower the fuel pressure, the flow rate goes down. And as a result, the pulse width can be increased. With a specific CCM calibration, matched with an ECM calibration, we found we were able to run the SD-60s on the 1.4T with NO problems. No injector misfire. No rich idle. In fact, our engineers thought the 1.4T idled SMOOTHER with the SD-60s than even the stock injectors, or the “green giants”! The ECM/CCM is simply a reflash (software update) for the vehicle. If you're switching injectors, you're going to be flashing the ECM anyway. We always thought if the SD-60s could be made to work, they'd be the best fuel injector for the 1.4T. They're the cheapest and easily available. With TRIFECTA's ECM/CCM calibration, now the SD-60s are a real option for 1.4T tuners! Now you can run the Siemens-Deka 60 lb/hr injectors on your Gen 1 Cruze / Gamma II with ZERO side effects! Getting enough fuel into a tuned-up 1.4T Gen 1 Cruze or Gamma II has been a challenge about as long as people have been modifying them. The factory fuel injectors top out at about 26 lb/hr of flow, which is enough for a tune-only, on gasoline, but if you want to switch to E85, or a larger turbo, you're definitely going to need larger fuel injectors.